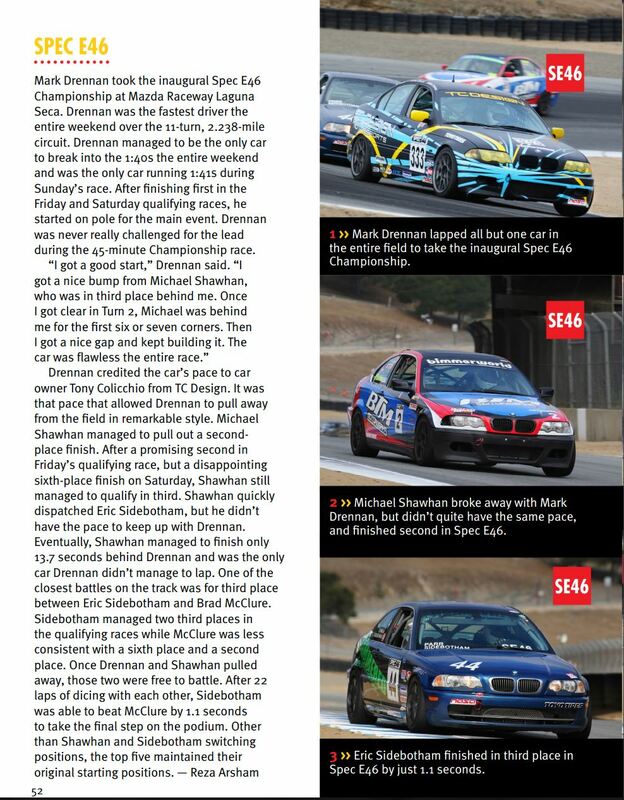 Mark Drennan took the inaugural Spec E46 Championship at Mazda Raceway Laguna Seca. Drennan was the fastest driver the entire weekend over the 11-turn, 2.238-mile circuit. Drennan managed to be the only car to break into the 1:40s the entire weekend and was the only car running 1:41s during Sunday’s race. After finishing first in the Friday and Saturday qualifying races, he started on pole for the main event. Drennan was never really challenged for the lead during the 45-minute Championship race. 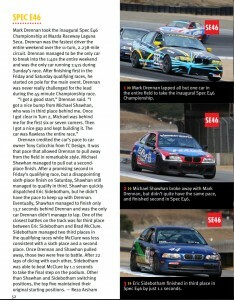 Drennan credited the car’s pace to car owner Tony Colicchio from TC Design. It was that pace that allowed Drennan to pull away from the field in remarkable style. Michael Shawhan managed to pull out a secondplace finish. After a promising second in Friday’s qualifying race, but a disappointing sixth-place finish on Saturday, Shawhan still managed to qualify in third. Shawhan quickly dispatched Eric Sidebotham, but he didn’t have the pace to keep up with Drennan. Eventually, Shawhan managed to finish only 13.7 seconds behind Drennan and was the only car Drennan didn’t manage to lap. One of the closest battles on the track was for third place between Eric Sidebotham and Brad McClure.